In a small casserole, heat water and until it comes to a quiet boil. Add tea leaves and steep for 2-3 minutes. Boil potato marbles until fork tender in the tea. Remove potato marbles once cooked and, season with seaweed salt and pepper and set aside. Meanwhile, reduce the liquid on the casserole by half, simmer on low heat then add honey. 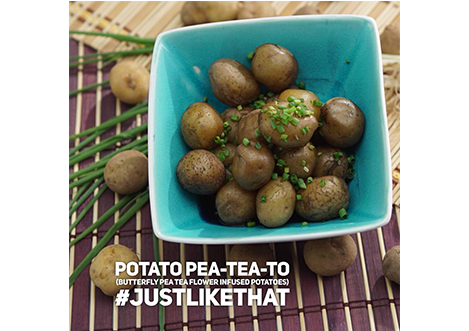 Serve in a nice bowl and garnish with spring onion and drizzle with the blue tea syrup.